Above: The eroded buildings at Fort Union National Monument still stand on New Mexico’s high plains northeast of Las Vegas. Learn about family-friendly events and activities at nps.gov/foun. 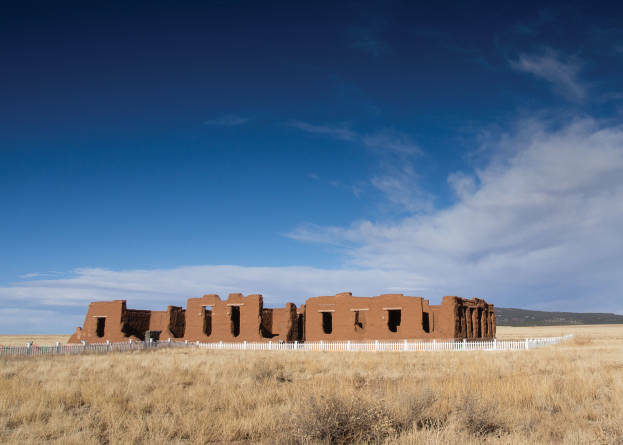 Fort Union is a skeleton fort garrisoned by ghosts and memories of the old Santa Fe Trail. The long-abandoned fort stands as the last outpost of an empire-building frontier, still determined not to surrender. Broken walls have crumbled in military precision leaving proud chimneys standing in stark aloneness. Roofless rooms, like empty shells, are floored with caved-in ceilings. Brick copings lie in fallen sections among weeds. ... When you leave this old fort, you look back. You are struck by the sheer stubbornness of its once living might.